Through the Inveneo Partner Program, client organizations serving rural and remote communities benefit from lower total costs, improved support, and access to ICTs that increase their capacity to serve. Contracting an ICIP or ITSE to design and install ICT solutions reduces average system installation and support costs by as much as 70 to 80 percent and overall project costs by as much as 60 percent, through a combination of lower local-labor fees and the elimination of Inveneo travel costs from the US. Local support also decreases service response times and improves overall service levels, thus lowering overall project risks for clients. 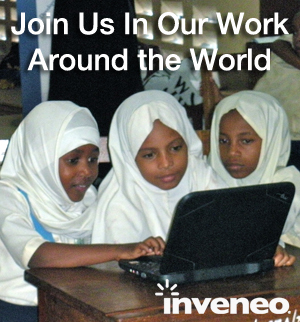 In each country where we work, Inveneo is developing an ecosystem of entrepreneurial technology companies that provide skilled and cost-effective installation and support services for organizations in need of life-impacting ICTs – a unique approach strengthens local capacity and ICT project sustainability. By partnering with Inveneo’s international success, you link to the people, programs and resources you need to grow your ICT business. Join the more than 120+ ICT entrepreneurs from around the globe that benefit from Inveneo’s local business ecosystem, innovative certification programs, and vibrant community of practice. Build Connections – to business prospects, growth opportunities and professional relationships that grow your bottom line. Acquire Resources – to enhance your business and workforce through Inveneo’s innovative technical and professional development programs. Share Information – Driving a vibrant ICT4D community to share best practices to improve sustainability and community impact. Increase Visibility – among those who live, work and visit Africa, South Asia & Haiti. If you meet these criteria, then take the first step in the process of becoming an ITSE and submit an application today! If your company meets these criteria, then take the first step in the process of becoming an ICIP and submit an application today!